The 1969 Stonewall rebellion is largely regarded as the catalyst for the modern LGBT rights movement in the US. However, vibrant communities all over the city were making their mark on New York’s civil rights, arts, and cultural scene. On the Upper West Side, the Continental Baths, perhaps the most famous gay bathhouse in the country, opened in 1968 in the basement of the Ansonia building at Broadway and W. 73rd. 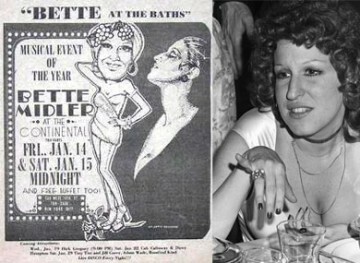 Live entertainment at the Continental included, most famously, Bette Midler, Barry Manilow (her accompanist), Patti LaBelle, the Andrew Sisters, and Sarah Vaughn. Disco was practically invented there. Mick and Liza were regulars. There was a juice bar. The Continental may be gone, but the site’s importance as a tangible reminder of the city’s LGBT community remains. There are many more, but they must be noted, celebrated, and protected so that these critical links to our common history are not lost. The NYC LGBT Historic Sites Project is searching out and documenting these historical and cultural sites across every borough. Come hear about their discoveries in our own backyard, such as Lincoln Center, the Dakota, Aaron Copland’s apartment at the Hotel Empire, James Baldwin’s Residence, and Hotel des Artistes. History will come alive as project co-directors Andrew S. Dolkart, Ken Lustbader, and Jay Shockley and project manager Amanda Davis draw our attention to the LGBT individuals and communities that have profoundly influenced and contributed to the history and culture of the city and nation. Tickets are required and available here.